While leaving the Mocha bar café on this day in 1961. Fire engines left the old fire station in the high street at full speed bells clanging and sped toward the town hall roundabout. They then headed up St Albans road, we followed in hot pursuit, in my old ford anglia. We lost sight of them at the traffic lights in St Albans road but by then the plume of smoke was a big clue as to where they were going. It turned out to be a fire at the British Moulded Hose factory in North Watford. I had my trusty old Agfa camara with me. After all these years – 50 to be exact – here are the photos, the memory still vivid. Where did that 50 years go? This page was added on 23/01/2012. Good lord amazing to see these pics. Remember it well as a pupil at Lea Farm Primary school, 11 years old. We were sent home early. We wandered up the railway line to the old crossing to get a better view. Lived at Aldbury Close Meridan Estate. Good lord amazing to see these pics. Remember it well as a pupil at Lea Farm Primary school, 11 years old. We were sent home early. We wandered up the railway line to the old crossing to get a better view. I was working for Charles Brightman & Son in 1961. I can’t remember why, but I was on the roof of the BMH the week previous to the fire. I think we may have been pricing up a job to build some sheds on the roof but can’t be sure. Obviously we didn’t get the job – no roof. I think that hoses were still being made at the time, I can recall the terrific noise of the machinery as we passed through on our way roofwards. Any one can help me trace them photographers ?? I believe the then unused upstairs of this plant produced most of the British Empire’s penicillin in the crucial years of 1943-1945 — leased to Ministry of Supply, operated by Glaxo, whose HQ was in (relatively) near by Greenford. Hi Ron great to see these pictures of the Fire at the BMH, thank you for putting them on the Net. I remember the Fire very well , I was 4 years old at the time. I remember walking up from the Tudor Estate with my Dad (who worked at the BMH at the time ) the short distance up Bushey Mill Lane , we crossed over the old crossing that had the gates at that time , just before they were closed to stop the traffic and more people getting too near. I remember the piece of thick wood that would come up to stop anyone crossing through the gate , pop up as they were being closed, thinking we were lucky to get so close to see it. We stood and watched the huge cloud of Black smoke rising high into the sky , with the strong smell of burning rubber in the air, something I have never forgotten . 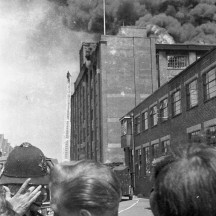 Apart from this fire I also remember an occasion when a Boiler exploded at the BMH in the area where my Dad was working, and a fellow worker was killed. My dad used to do fire watching on the weekends, and I went with him many times. The interior of the factory was dark and scary with lots of huge machinery , along with that ever present smell of rubber. The lifts were very industrial types with a chalky white residue powder present all over the floor and walls. The only good thing i liked was the canteen where we would get a bottle of Orange Pop, after walking around the factory checking all was well. It certainly was a moment in History for anyone who was nearby, i often wondered if there was any film footage taken by anyone. Love seeing old photos and film on Watford, thanks for putting them up. On 21 June 1961 I was in class at Corner Hall Sec Mod in Hemel (The prison on the hill). I was 12. I looked out of the window from my first floor classroom and saw the biggest pall of smoke I had seen up until then rising on a sunny and clear windless day.. (I saw more later). I thought at the time that it was Apsley Mills alight but it was clearly farther away than that. Teacher asked what I was looking at and as I turned to him he went “Oooh” and of ocurse by then everyone was looking. Probably everyone in every classroom was looking. Joined the HFB myself in ’67 at Hemel then Watford 1974 and Ricky 1977. On red watch at Watford then was Sub O Brian Buckle, LFm Roger Middleton and I was the new LFm. 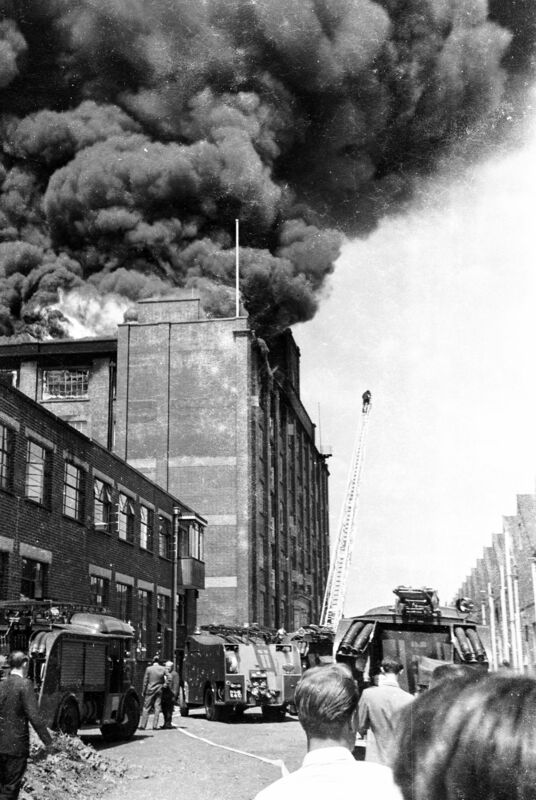 Hello Ron, yes I too remember the British Moulded Hose factory fire ( wasn’t it an asbestos factory? ) as my childhood home was in Southwold road. I was in the playground of Parkgate School at the time of the smoke billowing over our house. After school myself and friends went to watch, we counted several fire engines still there. At night when in bed, looking out of my window watching the last of its flames and smoldering die down. Hello Ron, Great to see the photos, like reliving the moment. We lived in a flat over Faith Heath ‘s Pram and baby shop in St Albans Road on the corner of Bushey Mill Lane. Our bedroom looked out onto the flat roof of the shop extension, and when we saw this massive black cloud of smoke billowing from the direction of the industrial estate, we opened the window and stepped out onto the flat roof to watch the fire, at the time we were not sure what was on fire, due to the thick smoke, it was only when it began to glow that we recognised that it was coming from B.M.H. On the day of the fire I was twenty years old, a member of the Watford Fire Station ‘Auxiliary Fire Service’ (AFS), but was working as an apprentice chef in a French restaurant in St James Street, Piiccadilly, London. 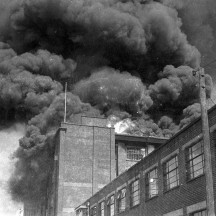 My emploters recieved a telephone call from the Hertfordshire Fire Brigade (HFB) Fire Control, at Hertford, asking whether I could be released from my work to attend a major fire at British Moulded Hose in Watford, this was agreed, and I left my workplace, (on my trusty BSA C15 motorcycle), and proceeded at top speed up the Edgware Road (A5), towards Watford Fire Station. 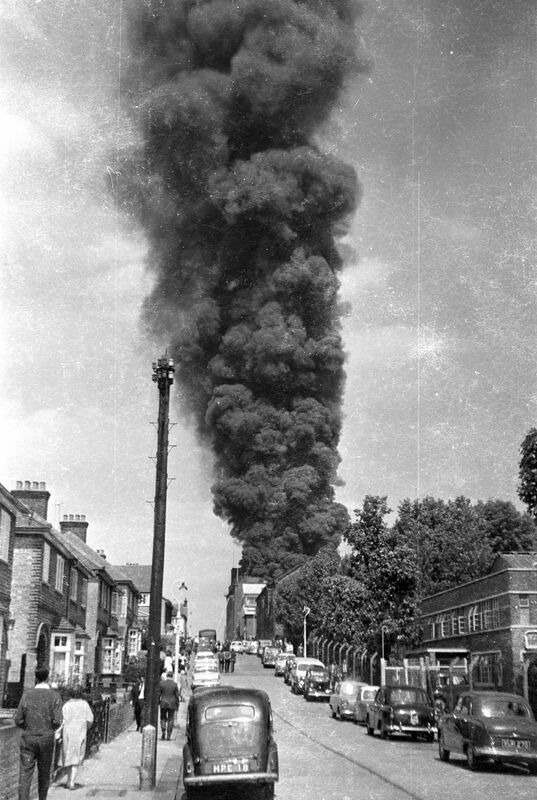 On cresting Shoot up Hill (between Kilburn and Cricklewood) I saw an enourmous plume of black smoke in the far distance, and I new at this stage that this was a ‘BIG ONE’. I arrived at Watford Fire Station approximately 35 minutes after leaving work (there was a lot less traffic on the roads in those days, and speed limits were not so strictly enforced, also THERE WERE NO SPEED CAMERAS IN WATFORD, as there are these days). At Watford Fire Station I formed a 3 man crew, and we drove our ‘Green Goddess’ to Bushey Mill Lane, and reported to the Incident Fire Control Point, where we were detailed to proceed to the River Colne bridge and set our ‘Green Goddess’ as a base pump to pump water from the river, up to the fire ground. With the aid of additional 4 intermediate pumps (fire engines), this water relay was succcesfully set-up in about 25 minutes. Following this I was then detailed to go onto the roof of the building with a hose, as part of a firefighting team, with a number of other ‘Full Time’ firemen, including Gerry Brooker (the only name I remember, and with whom I served as a ‘Full Time/Professional Fireman for 25 or more years). After a short time we could feel the heat coming through the flat roof of the building (at this time the fire was ‘Bottled-up’ inside, with smoke being released from the lower windows). All of a sudden, we heard and felt a loud crack, and the flat roof started to open-up beneath our feet. We immediately decided to take advice from ‘The Manual of Firemanship’ and took the appropritate steps, BLOODY GREAT STEPS IN THE OPPOSITE DIRECTION. We all made our escape to ground floor level, just before the roof split completely and vented the fire. In the circumstances, A VERY LUCKY ESCAPE !!! 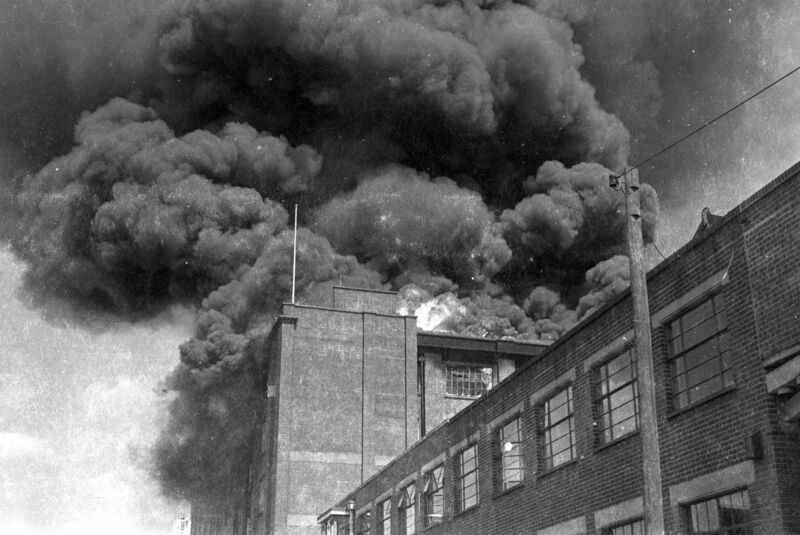 Along with my other 2 AFS collegues, we remained at the fire until about 10 o/c that evening, at which time we were transported back to Watford Fire Station, and went ‘Off Duty’, very tired, dirty (skokey), but pleased that we had done our bit to assist at what was probably the largest fire in Watford since the Second World War!!! 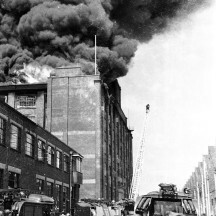 (At the height of the fire a message was sent to Fire Control-‘Make Pumps 20-Turntable Ladder (TL) required. HFB not owning a TL, one was sent from Luton County Borough Fire Brigade, as it was in those days. In addition Pumps came from all over Hertfordshire, as well as from the Middlesex Fire Brigade As it still was in those days). My father in law Eric Carpenter recently died from a cancer linked to working or being in the vicinity of rubber .He was infact a train driver who was part of the clean up removing the debris from the fire .Does anyone know of anyone else who died from cancer linked to the fire please? I was on my way from work in Berkhamstead to Birkbeck College in London that day and turned off to watch it from close to. Remember some of the roof caving in – awsome! I also remember the fire at BMH. Believe it or not I actually saw the smoke from my school playing field in Hemel Hempstead. Like everyone else I just can’t get my head around the fact that it was now more than fifty years ago! Likewise thanks for sharing these photos. 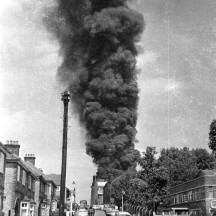 I was a pupil at Parkgate Primary school at the time and lived in Sandringham Road so vividly remember the fire and smell. Thanks for sharing these photos Ron. I was 11 at the time and was staying with a friend in nearby Knutsford Ave when this fire broke out. 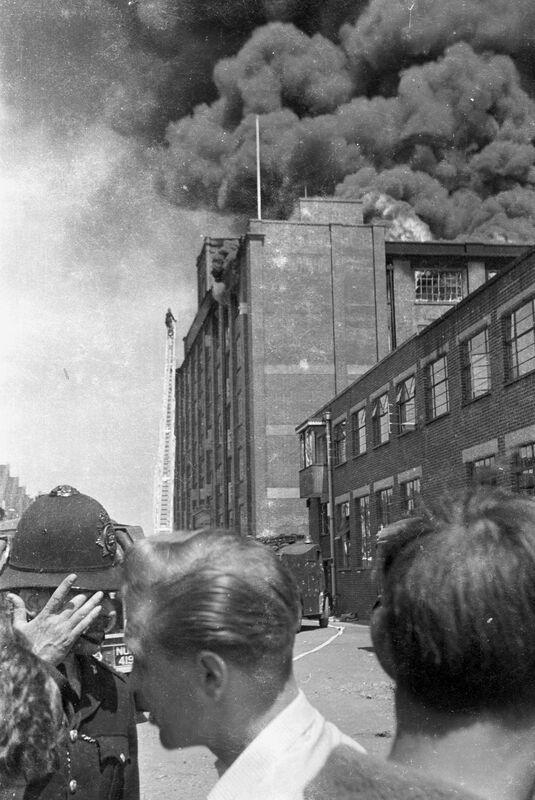 I remember well the dreadful acrid rubber smelling smoke and the large crowd that gathered to witness the biggest fire in the area for a long time. It burnt for ages before being brought under control and now I would be concerned for the local residents, insurance costs, damage to the environment, etc but at the time it was very exciting to an 11 year old!